I thought I would start an ASM game dev thread for my project. Hoping it will inspire others to take up the challenge and being a bit of a 'dev log' for my progress. With many thanks to Siekmanski for teaching me the dark art of interfacing with COM objects. I wouldn't have been able to even attempt such a feat without that prerequisite knowledge. 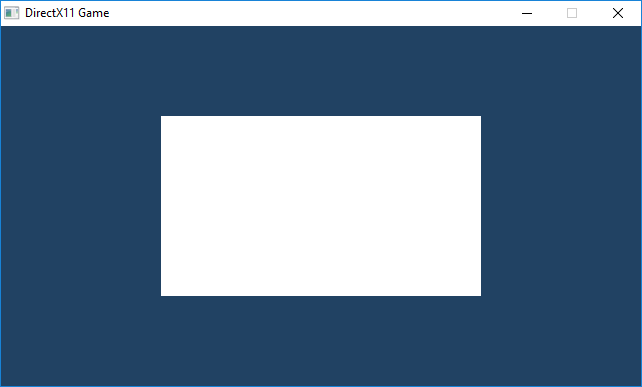 At this stage I have an empty DirectX 11 render window that is showing a cleared back buffer. This list will update and change as things progress and come to mind. DX11 Interfaces completed - ID3D11Device, ID3D11DeviceContext, ID3D11PixelShader, ID3D11RenderTargetView, ID3D11Texture2D, IDXGISwapChain, ID3D11VertexShader, ID3D11InputLayout. I will be following closely! Good luck, I'm curious to see the whole development. I love to watch the whole journey. It's hard but it's amazing to see every turn, every solution. Go for it man! Hats off to you my friend. 1. Get much shorter - need to finish project fast. 2. Get much longer - plenty of time for project, as well as many hurdles. Yes, but as long as you have knowledgeable friends to help, it may smoothen the ride so as not to be such a rocky road. Thats the 'can do' spirit! Good luck with your monumental project. I' ll stop by here periodically to check the progress of the project . This afternoon I took a step back and spent most of my time making things as robust as can be. Implementing and testing heaps of error handling, so if something goes wrong I'll know exactly where it is. This and making sure all interfaces are getting cleaned up correctly to kill all potential memory leaks in their tracks. Yeah, DDraw isn't something I have really touched. My earliest DirectX experience started with DX9. I skipped DX10 as it always felt like it was a stepping stone to something else and behold DX11 came out shortly after. I'm no guru at the API's, but I can normally achieve what I set out to do (after pulling out a heap of hair - haha). My plan is to recreate where I got to with my game when I started it in C++ many years ago. Which I am confident I should be able to do (with a bit of luck thrown in). I have a lot more to learn in MASM as I go though. There are a lot of basics that I will need to pick up along the way. Looking forward to the journey, learning new things it the part I love about development. More important to me than the finish line. This proves to myself that I am up to the task. Just kidding. Don't give up, no matter how high the mountain you are about to climb. Didn't get anything done today - killer headache, can barely see the screen. I'm probably better suited to programming 16 bit raster graphics. I'm currently running two concurrent projects, one in MASM and the other in C++. I'm doing this to make sure that operation is the same between the two, so if I stuff something up in my ASM DX11 library it should be easier to track. Will be interesting to see what the performance is like between the two projects as well. I am about to write some FPS counters so I can see how each build compares. You are building two projects concurrently. one in c++ the other in assembly. You want both to have roughly the same performance. So you are fluent in c++ I assume, and you wish to recreate same project with masm. If you do succeed (and I wish you the best) wouldn't it be like you are trying to rewrite c++ libraries in masm? Or maybe would be easier to convert disassembled c++ version to masm compatible code. Or are you in the learning process with c++ as well? Jeez, you really do have a lot on your plate at the moment. Then take a breather for a bit - then step by step bild the project in assembly. Trying to do both, plus learning to work with directX would surely give me migraines. Nah, I am pretty decent with C++ and DirectX 11, so I am porting my knowledge over to ASM. The pic in my avatar is where I am at with my game in C++. This is what I am aiming for in ASM. Just about have enough of the DX API converted to I can get there fairly rapidly I believe.